What could be better than a great hero story? TWO great hero stories! And there's no better place to find them than the Bible. Each Little Bible Heroes™ Flip-Over Book offers two stories of bravery, faithfulness, and kindness-straight from the Bible and perfect for little hero-loving hearts! In this book, read about the prophet Elijah. Then flip the book over to learn the story of John the Baptist. 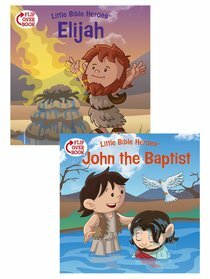 About "Elijah/John the Baptist Flip-Over Book (Little Bible Heroes Series)"